Great experience that everyone should try once in a lifetime! We felt really safe with our diving instructors as they know what they are doing very well. The view from above is definitely something you will never forget. Are you ready to take the plunge and feel the ultimate rush of adrenaline? You’ve chosen one of the best places on earth to make the leap! Calm your nerves as you make your way to your drop zone choice near the Melbourne area. At your chosen location, meet your skydiving support team, including your tandem jump master and safety officers who will train you on all safety procedures and answer any questions about your jump. You may need to spend additional time with the ground team depending on weather conditions. Once weather conditions are cleared, get fitted into all your gear and take a quick flight to up to 15,000 ft. Your tandem jump master will attach your harnesses together and will take care of all the technical details so you can just enjoy your experience. Ignore those butterflies in your stomach when the doors open and you feel the wind rush in. 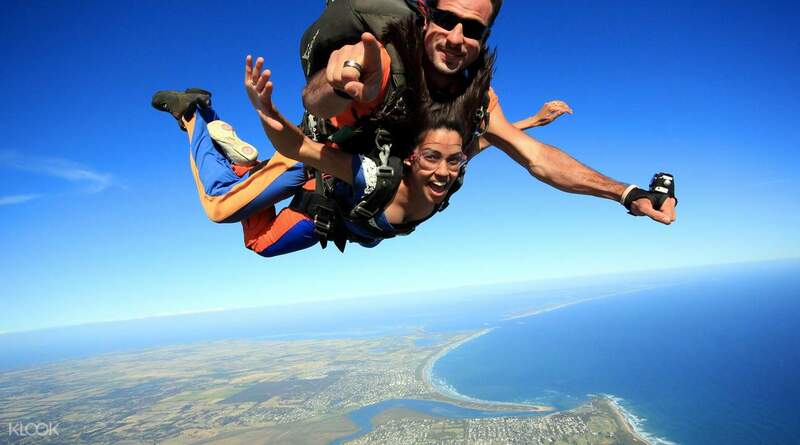 Leap out into the sky and try to enjoy the view as you freefall at speeds up to 200 km/hr for up to 60 seconds! Your tandem jump master will take care of deploying your parachute, and in case of emergency, all parachutes are equipped with the latest AAD technology to automatically engage at preset altitudes. Float through the sky for 5-7 minutes and enjoy a bird’s eye view of the best of Victoria before landing back on solid ground. A memorable experience you will never forget! 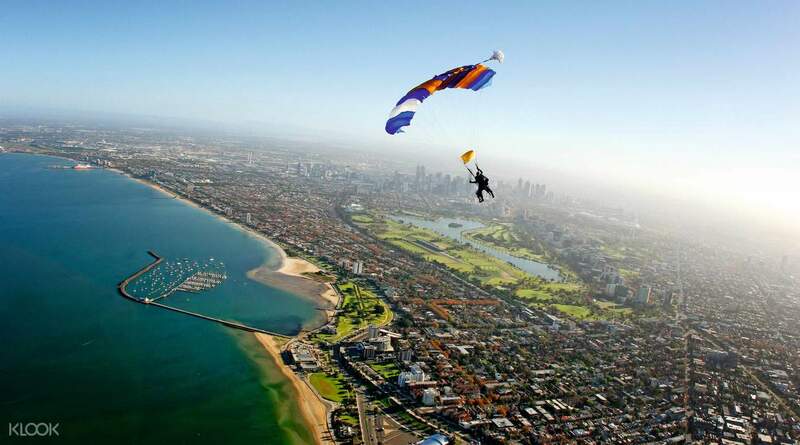 Skydive near Melbourne CBD and land on the beach! Experience 60 seconds of freefall from 15,000 ft! Absolutely breathtaking! Will definitely do it again! Absolutely breathtaking! Will definitely do it again! Simple process: 1) Klook voucher & APF 2) Pay AUD 35 3) Weigh yourself. Each group takes approx. 20 mins; 2 groups were before m (booked my slot at 10am, jumped at 11am). Instructor Dave was enthusiastic & considerate! Sharing his experiences with me, etc. Was nervous as skydiving is my virgin experience but I had so much fun and I felt so surreal! :’) Had brunch at Padre (nearby mall in Geelong) before heading back to collect the pics/vids given in a thumbdrive after 45 mins. Recommended! Simple process: 1) Klook voucher & APF 2) Pay AUD 35 3) Weigh yourself. Each group takes approx. 20 mins; 2 groups were before m (booked my slot at 10am, jumped at 11am). Instructor Dave was enthusiastic & considerate! Sharing his experiences with me, etc. Was nervous as skydiving is my virgin experience but I had so much fun and I felt so surreal! :’) Had brunch at Padre (nearby mall in Geelong) before heading back to collect the pics/vids given in a thumbdrive after 45 mins. Recommended! It’s a awesome experience!! The weather was poor originally and thus the skydive was postponed. The guide took us to a small town nearby and when the weather turned better, we finally get the chance of skydiving!!! It is a must-try event. It’s a awesome experience!! The weather was poor originally and thus the skydive was postponed. The guide took us to a small town nearby and when the weather turned better, we finally get the chance of skydiving!!! It is a must-try event. It is a nice experience for me. 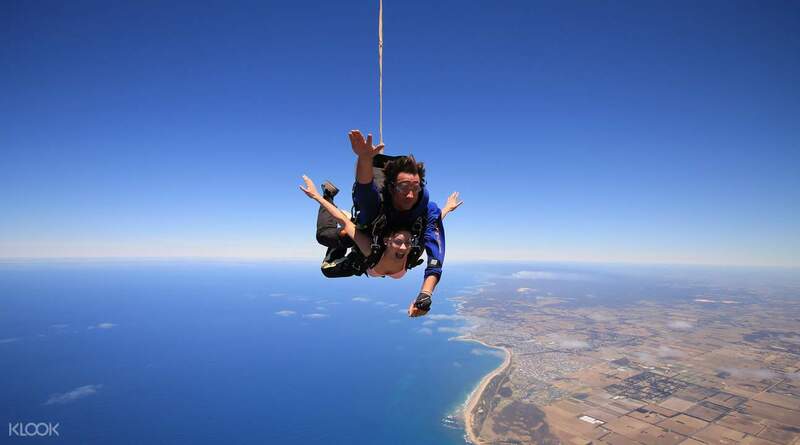 As I do not have car, skydive Australia provideed pick up service in city. It is easier for me to go the starting point. The instructor explained for me patiently. As the cloudy weather, I needed to wait until 12:30pm. Fortunately, I could have fantastic experience. It is a nice experience for me. As I do not have car, skydive Australia provideed pick up service in city. It is easier for me to go the starting point. The instructor explained for me patiently. As the cloudy weather, I needed to wait until 12:30pm. Fortunately, I could have fantastic experience. Had bad weather in the morning. However, they will inform you the next jumping timing through email and they allow a refund if choose not to participate. Had bad weather in the morning. However, they will inform you the next jumping timing through email and they allow a refund if choose not to participate. The best experience in my life! Just give it a try, trust your instructor and enjoy it!! Luckily I’m the first team to get on the plane. We didn’t jump at the first time, because the wind blew too strong to fly. So we landed in and waited for 2 hours & see if we could try it again. & we did! Yaaaa! The best experience in my life! Just give it a try, trust your instructor and enjoy it!! Luckily I’m the first team to get on the plane. We didn’t jump at the first time, because the wind blew too strong to fly. So we landed in and waited for 2 hours & see if we could try it again. & we did! Yaaaa! A perfect weather to jump out of a plane! Awesome instructor, friendly crews. If you haven't tried skydiving, I strongly urge you to try it once. It is definitely a priceless experience you'll live throughout your life! A perfect weather to jump out of a plane! Awesome instructor, friendly crews. If you haven't tried skydiving, I strongly urge you to try it once. It is definitely a priceless experience you'll live throughout your life! Awesome thrill experience!! The jump and all was fantastic, thankful for a beautiful windy weather! my tandem instructor, Angelo was AWESOME!! He is very friendly and fun! The photos and videos turned out good too! only that my expression was laughable! will recommend for first timers to get the handy cam photo and video package. We get to see the video and photos they gave us in a USB thumb drive on the computer on site. The only feedback i would give was the pick up arrangement. They scheduled to pick up at 7.30am at the bus stop outside Urban Central Hostel, waited until 7.45am we decided to call them with our temporary line. They claimed they delayed the pick up to 8.30am but unable to inform us because we left an international contact number. In future, please consider to email us prior at the very least.. We had to wait for 1 hour in the wind and cold as Urban Central did not allow us to wait inside their hostel. But the Jump was WORTH ITTT!!!! I'd recommend to book with KLOOK as you will be booked in prior. There were also Walk-ins, and they had to wait their turn. Awesome thrill experience!! The jump and all was fantastic, thankful for a beautiful windy weather! my tandem instructor, Angelo was AWESOME!! He is very friendly and fun! The photos and videos turned out good too! only that my expression was laughable! will recommend for first timers to get the handy cam photo and video package. We get to see the video and photos they gave us in a USB thumb drive on the computer on site. The only feedback i would give was the pick up arrangement. They scheduled to pick up at 7.30am at the bus stop outside Urban Central Hostel, waited until 7.45am we decided to call them with our temporary line. They claimed they delayed the pick up to 8.30am but unable to inform us because we left an international contact number. In future, please consider to email us prior at the very least.. We had to wait for 1 hour in the wind and cold as Urban Central did not allow us to wait inside their hostel. But the Jump was WORTH ITTT!!!! I'd recommend to book with KLOOK as you will be booked in prior. There were also Walk-ins, and they had to wait their turn.